Now that caught us totally off guard. The audio quality of Samsung handsets is usually top-notch but the S8300 is an unexpected exception to this rule. Our guess is that this has something to do with the microUSB to 3.5mm adapter, which might as well be the weak link here. However since the phone is meant to be used with this adapter this is hardly too great consolation. The Samsung S8300 UltraTOUCH performs poorly in virtually every reading in our test, except for the total harmonic distortion which is acceptable. 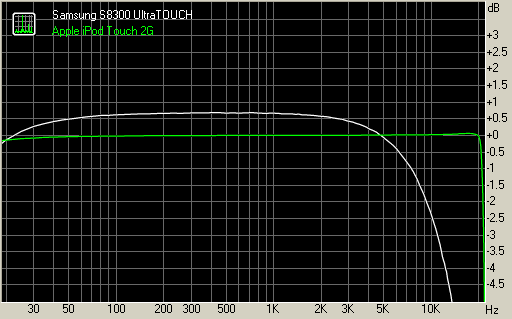 The frequency response graph suggests that the handset has its treble cut off for some unknown (and maybe again having to do something with the adapter) reason. The noise level, dynamic range and stereo crosstalk results are also way below the average we achieve in this test. Here is the table comparing the S8300 to some of the other handsets we have reviewed so you can see the difference. The Samsung S8300 makes use of the same camera module as the Samsung M8800 Pixon but in reality we got even nicer results by the S8300 due to the enhanced image-processing algorithm. The Samsung S8300 is capable of taking photos with a maximum resolution of 3264 x 2448 pixels. The videos recorded by the S8300 can go up to D1 (720x480 pixels) resolution at 30 fps, which still qualifies as pretty good even with the upcoming Samsung i8910, which can record in 720p HD. The camera interface is nicely touch-optimized and is certainly one of the most comfortable camera interfaces on a touchscreen device so far. The only complaint is that the auto focus settings are not visible in the viewfinder but instead must be changed from the menu. For instance, we took a few shots of buildings before we realized the phone was in macro mode. The camera snaps photos quite quickly and is ready for the next photo without much delay. This makes taking photos very enjoyable. Quite uncomfortably however, previewing the photo you just took is a bit more of a hassle. Pressing the 'play' button launches the gallery and shows you all the photos in it and you have to scroll to the last one you took. As we already mentioned the Samsung S8300 uses the same camera module as the M8800 Pixon but the software tweaks make a difference. The S8300 tends to produce slightly more saturated colors than the Pixon making them pleasantly vibrant. The noise levels on the images by the devices seem equal, but the S8300 UltraTOUCH resolves a bit more detail than the Pixon - especially the fine one. Overall, we are very pleased with the Samsung S8300 camera results. Here are some sample photos of the S8300 and Pixon for comparison and then all the samples we have made with the S8300. Video recording is among the best we've seen. It can record D1 video at 30 frames per second but unlike some phones where the video looks choppy even at 30 frames (some of the frames are interpolated so it's not really 30fps), this is flawless with excellent vibrant colors and unusually high levels of detail. S8300 is also capable of recording slow motion video shot in QVGA resolution at 120fps. The video quality is not very good however with a few artifacts visible. The alternative time lapse video recording mode shoots VGA video, so far the handsets with time lapse offered only QVGA. The fast motion result is up to 16 times faster than reality (that is 32 seconds of shooting results in 2 seconds of video). We had a lot of fun with that mode, just check out some of the videos we shot.